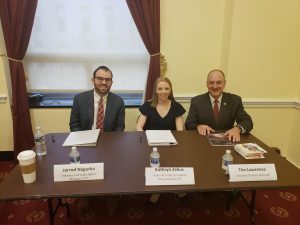 SkillsUSA Executive Director Tim Lawrence served as a panelist for a CTE 101 briefing for Hill staffers on Friday, Feb. 8. The event was a recruitment push for the House CTE Caucus and a co-sponsorship push for the House’s CTE Month Resolution. Hosted by Representatives Jim Langevin (D-R.I.) and Glenn Thompson (R-Pa.), the panelists talked about career and technical education (CTE), what CTE programs look like, Perkins V funding, and career and technical student organizations (CTSOs). Speakers including Jared Nagurka of ACTE and Kathryn Zekus of Advance CTE, along with Tim Lawrence, who used the lens of SkillsUSA to describe how CTSOs benefit both education and industry.